The Savannah River Site (SRS) - Citizens Advisory Board (CAB) is a part of the Environmental Management Site-Specific Advisory Board (EMSSAB), a stakeholder board that provides the Assistant Secretary for Environmental Management and designees with advice, information, and recommendations on issues affecting the EM program at various sites. Among those issues are clean-up standards and environmental restoration; waste management and disposition; stabilization and disposition of non-stockpile nuclear materials; excess facilities; future land use and long-term stewardship; risk assessment and management; and clean-up science and technology activities. The board's membership is carefully considered to reflect a full diversity of viewpoints in the affected community and region. Board members are composed of people who are directly affected by DOE site clean-up activities. Click here to find out all you need to know about the SRS CAB. 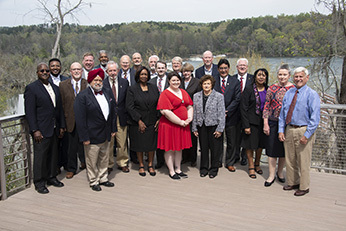 The SRS CAB is composed of 25 individuals from South Carolina and Georgia. The board members are chosen to reflect a full diversity of viewpoints within the communities affected by SRS. Members serve two-year terms and represent the business world, academia, local government, environmental and special interest groups, and the general public. Citizens interested in applying for membership on the SRS CAB are not required to have any special skills or extensive SRS knowledge. The general requirement is to have a willingness to attend meetings and learn about the plans and activities at the Savannah River Site and provide advice and recommendations from a public’s perspective. DOE values the input from the SRS CAB and endeavors to incorporate recommendations early in the planning process. Meet the current board members.